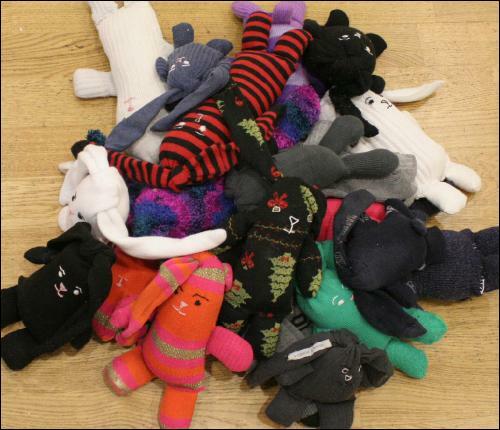 This web site is part of a public art project where people can adopt handmade sock bunnies made from unwanted socks. My aim was to mimic real life adoption possesses through the project, while at the same time look at my own personal response to being fostered and adopted myself. You can see comments and updates from adopters in the [BUNNIES] section. This project was developed in my time at the Chinese Arts Centre while on the Whisper [RESIDENCY] mid 2006. I was adopted at the age of one. For the first year of my life I was in a foster home. I don't remember my foster family but they gave me 3 things, my name, some photos of me growing up and a hand made sock rabbit. I felt that if I reproduced the bunny it would relive some hidden secret I had not seen before. You can see what I was given in the [BIO] section. I am keen to hear from other artists that deal with adoption as a theme in their work (this can include musicians, actors, workshop projects etc.). Also there are links to helpful adoption sites in the [ADOPTION] section. If you would like to find out more about this project, want to take part, comment or you are just plan curious please e-mail me in the [CONTACT] section. THIS WEBSITE HAS BEEN UP DATED. PLEASE VISIT THE NEW SITE AT www.sockbunnies.com. © Jessica Emmett 2006. All rights reserved.